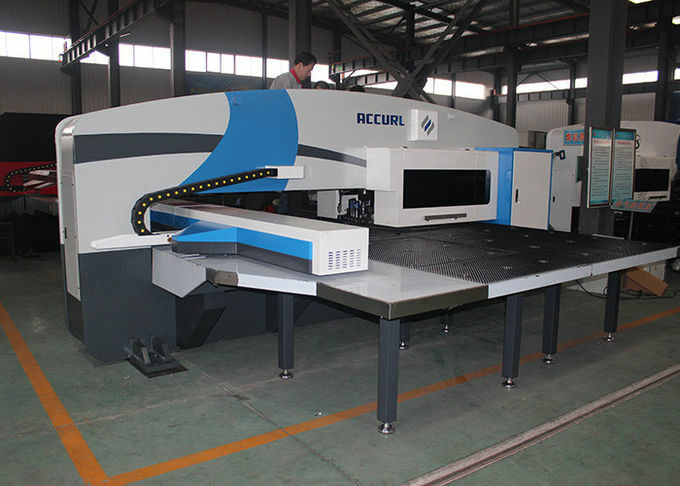 The new generation of ACCURL turret punch is a low energy, high efficiency turret punch with low environmental and maintenance costs. 2. 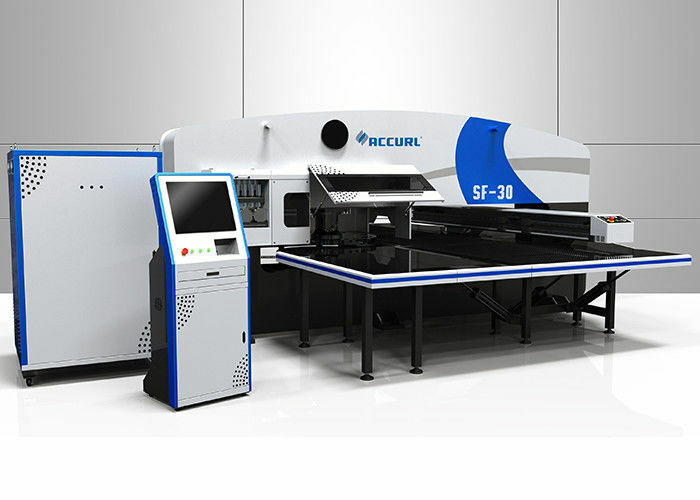 The ACCURL was designed with a think turret to ensure longevity of the machine and its tools and to minimize tool deflection. 3. 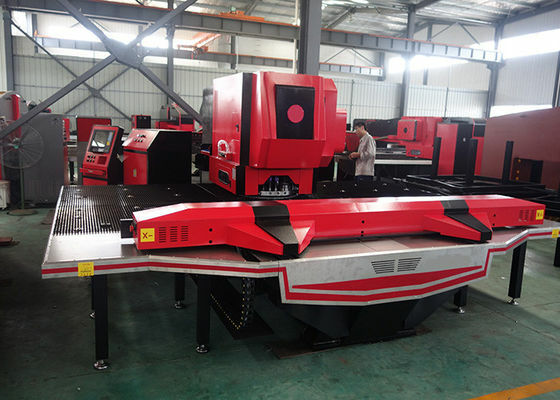 ACCURL performs full punches, hovering, marking and forming operations. 4. 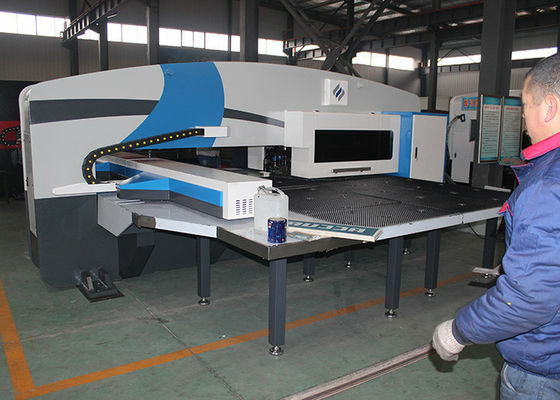 The SF model can be upgraded with our Ultra Package which can decrease part processing times by up to 40%. Finite element analysis is on high performance computers is used in the design process. 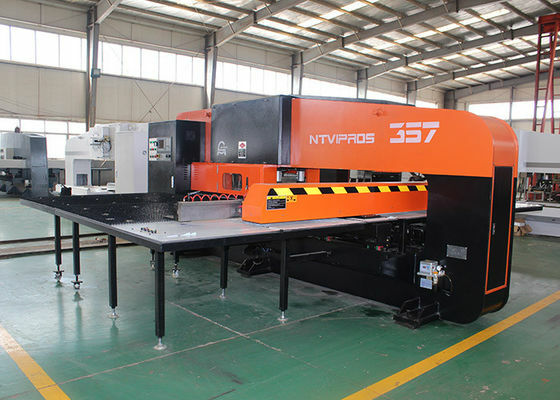 The concept consists of two fully enclosed box fabrications that are welded put under high load and stress relieved. The result is reduced vibration and deflection under full loads providing greater part precision, reduced tool wear, and noise reduction. A large (15.7 x 23.6) programmable work chute allows automatic discharge of parts into a parts container. This feature is available optionally on all other models. The position of the sheet clamps are automatically set by standard program information. Contact sensors automatically stop the machine if these sensors detect any movement of the sheet while it is clamped. 1. The ACCURL has a thick turret to provide improved accuracy and longevity of the tools. 2. The turret itself is made of s50C and undergoes rigorous testing. 3. The turret comes with 4 main layouts from 32 stations to 52 up to 4 auto indexing stations. 4. Permanently engaged auto index drive system reduces errors and avoids downtime. Driving System Drive Type Servo V.R.